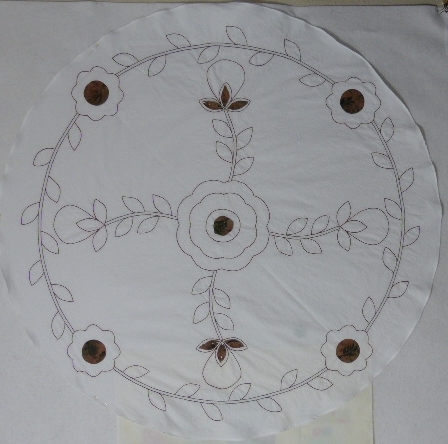 I am finally finishing another project, a round embroidered tablecloth. I started this because I was absolutely nuts in 2010 and 2011. During those years I presented a block of the month program for my local quilt guild (Calico Cut-Ups). 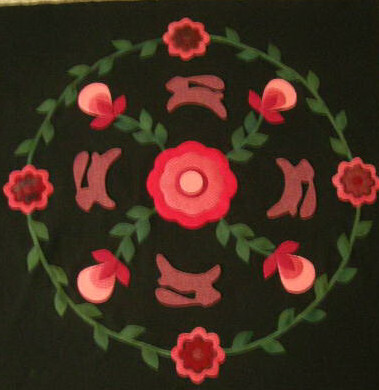 In 2010, I did a sampler quilt and in 2011 I presented a monthly tutorial on a different aspect of applique (A is for Applique). I like to have handwork to do at night so I used my overall design as an embroidery project. I then put this away because I was busy with other things. Last month I pulled it out again and decided to do a rolled hem to finish the edge. I carefully folded the piece in quarters and used my circle ruler. Now my circle ruler is not long enough but I just turned it a little bit at a time, making a mark and then drawing the circle by hand. Here’s a little tip when drawing an arc on folded paper or fabric. When you mark at the fold, make your mark perpendicular to the folded edge–otherwise if your mark is curved, you will not have a smooth curve at that point. Experiment with a piece of paper and you will see what I mean. Cmon, you know you want to–get up, fold some paper, draw and cut. 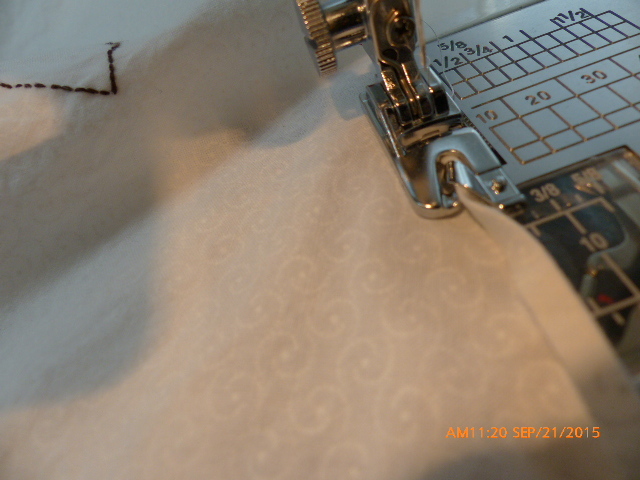 I used Foot D on my Janome – a definite timesaver compared to doing a rolled hem by hand. I thought this project was quite boring so I’m adding some hand applique, a little at a time. I’m not going to fill in every leaf, but have done the sepals on the buds and will probably add three leaves between the outer flower circles. This will be a nice summer cloth for my round table. It is approximately 41-inches across. The other small project I finished in 2011 was a wool circular tablecloth. 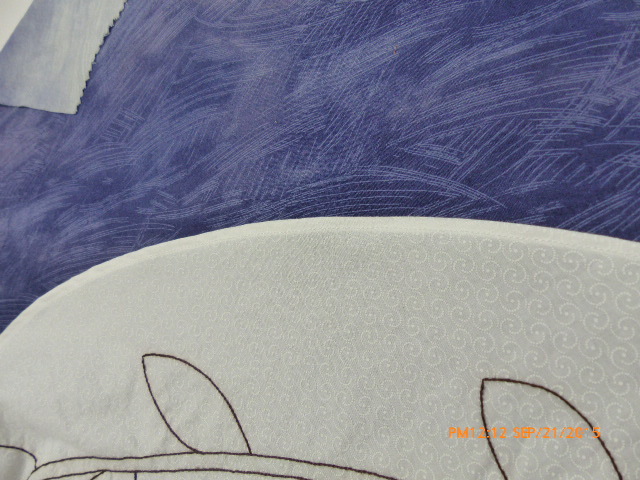 It is appliqued by machine and also quilted using my domestic Janome. This is called 4Rabbits. The bias binding was finished by hand.